While I read Bad Blood, John Carreyrou’s detailed account of the rise and fall of Theranos, two thoughts immediately came to mind. First, if North Korea ever launched a startup, Theranos would be it. The company operated the same way Kim Jong Un does: non-functional products, “launches” that backfire, massive fraud, dead employees, and a creepy old guy who monitored employee email and Internet usage. Second, this story is amazing. They need to make it into a movie. Then I realized that they are making it into a movie starring Jennifer Lawrence, with Adam McKay from The Big Short set to direct. After extensive research, I’ve determined that North Korea did not officially back the company, but I wouldn’t be surprised to learn that the Kim family invested via Rupert Murdoch or Betsy DeVos. Bad Blood is my favorite non-fiction book of the past decade. It’s so good that it almost seems like fiction – a John Grisham thriller, maybe. It takes the best parts of history’s most famous downfall stories and injects even more intrigue by adding the one element those stories lacked: human life. This book isn’t directly related to recruiting or working in the finance industry. What is This Book About, and Why Should You Care? In case you’ve been living in a cave in Antarctica for the past ~3 years, Theranos was a massively hyped “unicorn” healthcare startup that aimed to perform hundreds of blood tests from a single drop of blood pricked from your finger. No more needles! No more vials of blood! Just one small problem: it is impossible to do this. Blood from your finger is different from the blood in your veins because it is partially oxygenated, it’s contaminated by interstitial fluid, and the volume is very low. In plain English, there’s not enough data, so you can’t solve the problem with a medical device. You can do a few simple tests, such as the one for glucose levels, with finger-pricked blood, but not the hundreds of complex tests out there. Despite that, Theranos still managed to raise $900 million over the years at a peak valuation of $9 billion. But after more than a decade of lying to investors, threatening employees, and using non-functional devices to diagnose patients, Theranos finally began to implode in 2015. That’s when WSJ investigative reporter John Carreyrou received a tip about the company, began his deep dive into it, and finally published the article that sparked a firestorm. After that, the company’s trajectory resembled that of a spaceship being sucked into a black hole. Regulatory agencies banned Theranos from running a lab, Walgreens ended its partnership, the COO was forced out, investors and partners started suing the company, and the SEC charged the CEO and COO (Elizabeth Holmes and Ramesh “Sunny” Balwani) with massive fraud. A criminal investigation is underway, and indictments are likely. Most likely, Theranos will soon be liquidated, and both the top executives will be in jail. This story is a textbook example of how to do everything wrong at a startup. And it’s a cautionary tale of what to avoid and how to detect deception if you’re an investor. So… How Did a North Korean Startup Survive for Over a Decade? Even if you’ve followed all the WSJ’s reporting on Theranos, you probably have one big question: How could such a fraudulent company last for so long? Didn’t anyone notice that the Empress had no clothes before a reporter came along? Bad Blood makes it clear that plenty of people were skeptical from the start. The company never published peer-reviewed literature, its Board of Directors consisted of fossilized former diplomats who knew nothing about medicine, and it never attracted serious life science VC investors. The original Ph.D. student who founded the company with Elizabeth Holmes thought her first idea was “science fiction,” and dozens of disgruntled employees quit along the way, convinced that the entire operation was a Potemkin village. Business Partners: Walgreens was paranoid that CVS would get the technology first, so they entered the partnership without proper due diligence. One skeptical consultant kept warning them, but he was silenced. This one goes in the FOMO (“fear of missing out”) bucket. Investors: The company raised money mostly from family offices and VCs with no healthcare experience. And they pointed to early investors, such as Tim Draper and Larry Ellison, as evidence that “the smart money” was on board. VCs with a track record in life sciences, such as Google Ventures and MedVenture Associates, passed when they realized the company couldn’t answer basic technical questions. Employees: Pretty much all the employees figured out that the company was a fraud, which is why turnover was extremely high. However, Theranos was super-secretive and used expensive lawyers and private investigators to threaten ex-employees who could have become whistleblowers. Regulators: Theranos operated in “regulatory no man’s land” by labeling its diagnostics “lab-developed tests,” which are not regulated by the FDA. Eventually, the regulators caught up to them and started conducting surprise lab inspections because of tips from anonymous ex-employees. Patients: The company used its broken device(s) to test patients in Arizona and California, which later resulted in ~1 million voided tests. Amazingly, they threatened doctors and patients who left bad Yelp reviews, but nothing could hide fraud on this scale. These live deployments finally pushed it over the edge and alerted the broader population to the scam. 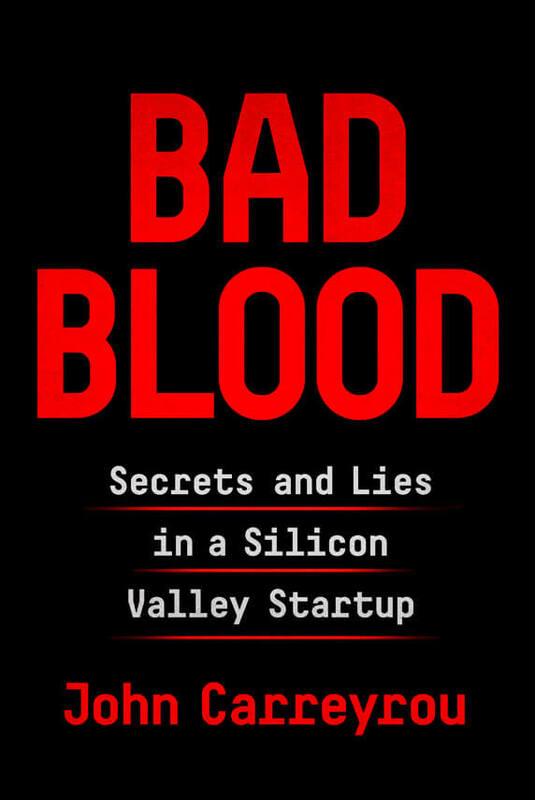 I’ve followed the Theranos story closely, but Bad Blood was great because it put together all the pieces in a logical order and gave them more emotional resonance. The book conveys superbly the human tragedy, ranging from patients who received the wrong diagnoses to employee Ian Gibbons, the chief scientist who “committed suicide” under suspicious circumstances. But what I loved most were the vividly drawn characters. In particular, “Sunny” Balwani, the #2 at Theranos, seems like an amalgamation of every single horrible VP in investment banking. Not only did he micromanage employees while knowing nothing about the product, but he also had the social skills of an autistic monkey. When an employee quit and refused to sign a confidentiality agreement, Sunny sent a security guard after him, called the police, and then told the police the employee stole property. Oh, and the whole time Sunny was at the company, he was also in a romantic relationship with CEO Elizabeth Holmes, who was ~20 years younger. That said, the book isn’t perfect. There are a lot of characters to remember, and sometimes I lost track of who was doing what at which time. The book moves in rough chronological order, but chapters tend to be thematic or character-based rather than time-based. So, similar to TV shows like Westworld, the exact timeline can be a bit confusing (though the lack of robots makes it far less convoluted than Westworld). Finally, the transition where John Carreyrou enters the story toward the end is a bit jarring, since the preceding chapters are written in the third person from the perspective of others. Your story is everything. That’s why we focus on it heavily in the Interview Guide and the articles on this site. A great story can sell anything, whether it’s a product or yourself in a job interview. Elizabeth Holmes was a great storyteller who idolized Steve Jobs, and like Jobs, she could also sell anything. But if the claims in your story can be disproven easily, your story will fall apart. It’s not unusual for an early-stage biotech startup to make aggressive claims about its future products. But what was unusual – and fraudulent – was to claim that the product was ready for real-life usage, when it clearly was not, and then to use it on patients. This is why it’s a terrible idea to lie or even “spin” facts that can be easily disproven in interviews, such as your abilities in other languages, graduation dates, grades, employment dates, and job titles. So many readers have gone too far with spinning that I’m going to rewrite the article on the topic later this year. Many technology companies that launch apps, software, and even hardware adopt a “fake it ‘til you make it” attitude. That’s fine for technology because no one dies if a smartphone app crashes. And many students have famously dropped out of university and then started world-class technology companies… because you don’t need that much experience to get started. Healthcare, though, is a different ball game. Your product can’t “kind of work” unless you want to kill people. And it’s almost impossible for 19-year-old university dropouts with no medical experience to start important healthcare companies. If you’re trying to move into finance, you can use these industry differences to your advantage. For example, if you have significant medical/biotech experience, you’re much stronger as a career changer candidate if you target healthcare groups at banks and VC firms. They want people like you because no university graduate could understand those sectors as well as a Ph.D. or industry executive. But if you want to get into the industry at the last minute, or you don’t have real work experience, it’s better to target sectors such as technology or consumer/retail where you can get up to speed quickly. Many students at top universities believe that since they got into a top school, they are experts at everything – or at least, they could quickly become experts at anything. Except… they’re completely different fields. Facing down the Soviets in the Cold War is impressive, but it doesn’t make a 90-something former diplomat qualified to judge the merits of medical devices. I outlined in a previous article how you can outwit and out-hustle Ivy League students to win job offers, and this point goes along with the advice there. …but will they take the time to learn the in’s and out’s of stock pitches, find contact information for hundreds of industry professionals, and then contact them in a socially calibrated way? I’m not sure, but most “experts” would say it’s beneath them. As Theranos raised $900 million, Elizabeth Holmes spent much of the money on lawyers, new offices, a contingent of bodyguards, and yes, even bulletproof glass for her office (!). She also put a ton of time and effort into distribution partnerships and sales. For an early-stage technology company, it’s not necessarily wrong to focus on sales before your product is fully functional. But for an early-stage healthcare company, nothing matters except for developing a working solution, passing clinical trials, and winning approval from regulators. If your new device or vaccination or surgical method doesn’t work, partnerships won’t save you. Consistently, companies focus on the wrong things and ignore the stage they’re at. I even did the same thing back when I made the mistake of creating a $5,000 product for a $500 market. In a way, I made the opposite mistake of Theranos: I had products that worked, and I wanted to make them even better to the point where no one noticed or cared. But it was motivated by the same mistake: not understanding the stage I was at. 5) If “The End Goal” is Your Focus, Rethink Your Life! When Holmes was young, a family member asked what she wanted to be when she grew up. That answer demonstrates why the fraud reached this level before collapsing: rather than trying different skills, becoming good at one, and then pursuing it, Holmes started with the end goal in mind. And she stopped at nothing to pursue it, even if it meant lying to investors, threatening employees, and putting patients’ lives at risk. Most entrepreneurs start working in a specific industry, get to know people, learn the key problems, and then launch new products/services. Otherwise, it’s impossible to know what people will pay for and which solutions are feasible vs. science fiction. Idolizing Steve Jobs and aiming to become a billionaire aren’t real goals; they’re aspirations of teenagers who do not yet know themselves. As far as applicability to the finance industry, well, take a look at the comments thread on this article about finance as a long-term career. Both Steve Jobs and Elizabeth Holmes possessed “reality distortion fields” that let them recruit subordinates and convince investors, Board members, and the public of almost anything. But Jobs also had a firm grasp on his own reality, and despite some exaggerations and problems, delivered products that worked. By contrast, Holmes forgot to apply self-shielding, which let her reality distortion field twist her own perception of reality. Aside from the upcoming indictment and trial, I don’t think we’ll be hearing much from her. But if you want to find out more, the rumor is that she might head to North Korea. Apparently, she’s an excellent fit. Wow very well thought-out and insightful review! Yes I feel the same way as well, the book is so good, and the story is so gripping. I appreciate the article Brian. Amazing how many prominent board members were involved with the firm and no red flags ever came up. I have two opportunities to pursue. I am currently an auditor at the CPA firm with interests more in PE or VC down the road. Option #1 is with a consulting firm that specializes in accounting services for PE funds and software implementations. I do not believe it has any formal valuation/modeling work, but I figured the exposure to these funds/managers and also their processes could help down the road. Option #2 is a corporate analyst role with a public company that focuses on forecasting and other corporate finance services. There is financial modeling involved that would be related to more internal aspects of the job, but to the best of my knowledge they do not have a corporate development function so I’m sure any M&A activity would involve me. I would imagine getting the financial modeling experience that #2 offers would be the way to go if PE/VC is my ultimate end game, but just curious on your thoughts. Yes, I would go with Option #2 for the same reasons that you mentioned. I also had a recent opportunity come in that is a financial analyst role at a start up. This position is really a jack of all trades considering it is a small department. It has modeling listed in the job description and would help with VC/PE funding or other investments. Its compensation is below par, but I think the experience would be very worthwhile, especially trying to move into a PE/VC role and/or looking at a top 20 MBA program. I think this opportunity would be more worthwhile than option #2. I’m not sure about that one because brand name also matters. If the public company is well-known, that could help you more than a more relevant role at an unknown startup. I think it would be great if you could inspire us with more fiction/non-fiction books you like. I would like to – but most of them have nothing to do with finance/careers. Can confirm, I’ve had this backfire, and it’s not pretty when it does… the “risk-adjusted return” from this kind of maneuver is not in one’s favor. “When Holmes was young, a family member asked what she wanted to be when she grew up. I think you’re fine as long as you stay away from healthcare startups… crypto seems like a better bet for billionaire status, anyway. Thanks for the review, I put it on my list of next book to read. Any other business/finance books that are entertaining and not too mainstream? Thanks. At the moment, not really. I rarely read business/finance books unless they’re story-based, because I don’t want even more of it after spending 12 hours per day on the topic.